The Future is Nasty. Let's get creative! Sidewalk Series #5 , 2017 will be included in Nasty Women Boston, a group exhibition demonstrating solidarity among artists who identify with being Nasty Women in the face of threats to roll back women's rights, civil rights, and reproductive rights. It also serves as a fundraiser to support Color of Change and Planned Parenthood. Please join me at the Opening + Art Sale on Friday, September 8, 6—9 pm at Laconia Gallery, 533 Harrison Avenue, Boston. Sidewalk Series #5, 2016. Found concrete, gold leaf and modeling turf. “REAL/IDEAL (Turning Utopia Into Reality)” at the Boston Center for the Arts Mills Gallery is a reassuring show for tense times. In recent years, Randi Hopkins, the center’s director of visual arts, has elevated the annual resident artists’ exhibition above the level of an obligatory members show, which can be scattershot. This year, curator David Guerra invited 18 residents and 10 guests to contemplate utopia. These artists’ ideals range from personal to philosophical to societal, but they hang together on hope. Kate Gilbert installs her photo “Untitled (Chinatown Housing)” above rocks and asphalt adorned with gold leaf, moss, and a nylon sack. In the photo, a dress Gilbert wore for a public performance piece about economic inequality has been made into a tent in a deserted lot. Each element here sets off bare subsistence with touches of value and dearness, and the prospect of wholeness. Utopias are easy. It’s in dystopias such as Gilbert’s that ideals are most cherished. I'm honored to be part of Real/Ideal: Turning Utopia Into Reality at the Mills Gallery through September 17. The exhibition itself challenges existing notions of curating in an attempt to reflect on the ideal exhibition. The works, although selected by David Guerra, are ultimately presented by the public who are asked to co-curate, design and share their personal narratives within the space through the gallery’s floor plan and the artwork. In the three pieces in the show, I imagine a dystopian reality where the only available shelter is on one’s back and the cost of real estate is so exorbitant that even a chunk of asphalt becomes a precious commodity. As sculptural objects, these works present one possible reality. But as performance ephemera from Interdependence Day Walk With William 7/3/17, they are props in an ongoing conversation with William DeLove, my homeless, wheelchair-bound friend about the economic inequality in Boston, how much we need to survive and how, together, we can create a more interdependent future. Exhibited is a photograph of a dress that I wore during a performance walk with William, erected as a tent, two miniature worlds I created from the largest pieces we carried, and the "Cautionary Sack" I carried with seven pieces that remain undeveloped. It began in September 2015, when the image of a lifeless Syrian boy, Alan Kurdi, lying face down on a beach was repeatedly distributed in print and digital media. It gripped me like no other image of a bombed out building or overcrowded refugee boat had done. It put the plight of the millions of Syrian refugees front and center in my consciousness. Up until that day, my studio practice had been a place of refuge and solace from the all-consuming job of starting up Now + There. Creating new works for the “Sidewalk Series,” a critique of real estate development in my Boston neighborhood, is a sensual thrill for me. 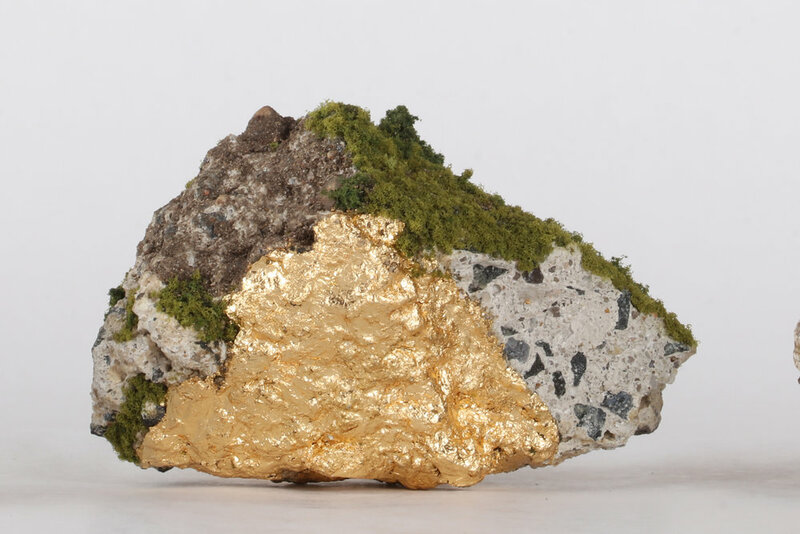 I get to steal bits of public property – cast off pieces of asphalt and concrete – and make luscious green and gold worlds with them. The making process is slow and seductive, like painting, but in a manageable size and format. And playing developer is a fun fantasy. That changed as I looked at Alan. At that point I was preparing for two career stretches, one to develop a curriculum for a 200-level course at Connecticut College, which became Shelter and Comfort, and the other, to develop a Sanctuary Series workshop for the Isabella Steward Gardner Museum’s experimental program to activate the senses, rejuvenate, and inspires. This is one month’s worth of Friday, Saturday and Sunday issues of the Boston Globe and New York Times. One step away from hoarding? For the Gardner proposal, I used the opportunity to explore the proliferation of violent imagery in print and broadcast news through the co-creation of an object, a mandala with hundreds of violent images selected by participants. That workshop and another subsequent one at Babson College chapel have opened up a new direction in my practice. I can’t throw away newspapers! Seriously. After the workshops, I continued reading the papers and instead of getting stuck on a horrific photo, pouring over its gory details and not being able to move on, I could see the violence and read about it. After this 14-month practice, I’ve become slightly less shocked, more desensitized. And just in time. With the violence manifesting in our country via vicious hate speak, the entire paper is full of viciousness. The printed word is taking on power I’ve never seen in my lifetime. Now, I’m taking in the entire paper and scrutinizing it and I feel compelled, like before, to make something with it. I take it in with my eyes, brain, heart and with my hands. I cut it into hundreds of small shapes, glue them together and form something new, a sculptural object that fits in my hand. One daily paper can fit inside my hand. It seems digestible that way. It feels powerful. It's almost like a weapon. I’m excited about this new direction and by sharing it here, I’m giving myself the public challenge to keep it up this exploration by creating one paper accumulation a week. Help hold me accountable and let me know what you think here and on Twitter and Instagram. Recently I spoke with Boston sculptor Donna Dodson about sculpture, the characters in my work and my compulsive desire to collaborate. "Kate Gilbert, Keeping Up With The Active Artist", Artscope, Mar/Apr 2016. p. 54-55. Read it on Artscope or download the pdf.